We just returned from our appointment at the embassy. It was long. It was hot. The bathrooms had no tp. And I'm a horrid mother because Fetya was hungry and I told her we could eat the last banana when we got on the bus. I was talking about the banana she ate on her way to the embassy appointment. Not so good. At least I didn't lie about the mango juice in the backpack. After waiting for well over an hour I took Fetya outside. Shortly afterwards, Marshall Coen came outside with Josiah. It was picture perfect Daddy parenting. Marshall says, "Uh, Seth needs you to change his diaper. They don't want him to leave the waiting area." Nice. The kiddo hasn't had a "serious" diaper since we got him yesterday. I guess he finally loosened up enough to do it in the waiting area. No changing tables, just me, Josiah, and my lap. It turned out to be a real doosey--both of us were wearing some of it by the end. Halfway through the mess, Marshall runs outside to tell me that they have called our names and we need to hurry upstairs. When he saw what I was dealing with he smirked then said, "I can see you are in the middle of something...I'll tell them you're on your way." Yeah--only because I ran out of wipes. Yuck. Then I grabbed Fetya's hand (no hand washing available) and we raced upstairs. Very simple, short, and hopefully successful. Seth is getting some serious QT with Josiah. He's had to step up and take charge of Josiah's care because Fetya still isn't so sure about Daddy. We had an interesting morning--went to the playground then swimming. On purpose Daddy went into the pool and Mommy stayed on the side. Fetya let Seth swim her around a bit, but soon decided she would rather avoid him and play with Selam (9 year old from the TH). Selam, as is probably true for most of the kids at the TH, is more than willing to be a junior parent. We are just letting it go--Fetya is so confused and scared. It's like a slow cut on the cord to have Selam here. Easier and harder at the same time. So, the embassy--it went well. As far as we can tell. We will get the kid's visas on Friday morning. The other three families went through also. The Coen's have some added complications with Silas' visa because they are returning to Germany. Hopefully tomorrow it will be cleared up. We rested this afternoon and plan to have dinner with the group in an hour. Fetya, Josiah, and I laid on the bed and fell asleep. Very sweet. She's still sleeping and I'm beginning to wonder if she may have a hard time getting to bed tonight. Today, Tuesday, we were scheduled to visit the Mother Teresa Orphanage and the ALERT Hospital in the morning and then go back to the Transition Home to pick up our kids. Flexibility seems to be a necessity for a trip of this nature, but everything works out well in the end. As we loaded the bus we learned we would in fact be touring a coffee factory. This was actually a great time and was very informative. We got to see every step of the process. The farmers' beans go through a series of sieves and conveyer belts which finally end up in a large room of ladies who sort the beans even more. We learned the size of the bean correlates to the quality of the coffee. They then bag some for export and others they roast before exporting, but not before the professional coffee taster (I might have missed my calling) roasts small batches to determine the final overall quality of the batch. We were able to sample their wares and purchase some bags for the road. The time passed fairly quickly so we were behind schedule and Apryl's stomach was quite upset, so we decided to skip the lunch out, head straight for the Transition Home, say goodbyes, pass out gifts and take our kids. We then proceeded back to the hotel; some folks ate, but we decided to give our gullets a well deserved break. Fetya required some extra pre-embassy medical attention, so she went with Fortuna to the Dr.'s office while we brought Josiah back to the hotel. He is such a sweet baby, he took a nice bath and had some lunch. The only time he's cried to date is when Apryl was a little slow on the draw with the bottle. Fetya returned shortly before I had to meet our group in the lobby to complete the forms needed for our embassy appointment tomorrow. I don't really have the emotional fortitude to recant the story of Fetya's mysterious health condition. We got an email from Rachel many weeks ago about a medical concern, but it was somewhat resolved when an American pediatrician visited the home. He allayed our worst fears and gave us something else to think about. His diagnosis wasn't in agreement with the Ethiopian doctor. Evidently, we aren't completely in the clear for Fetya's health. When the doctor for the embassy checked her out, he needed more information. After seeing her for a third time, he wrote up the medical with details that will deem her 'special needs'. He agreed with the initial diagnosis...the scary one. We have been flooded with emotions; not really sure what is really going on with her. In order for our kids to leave the countrythey must get visas from the embassy. We have to have permission for them to come into the US. We will only get permission if everything we said last year in our dossier matches the little tykes who show up at the appointment. If anything is amiss, paperwork needs to be redone. You see where I'm going? We find out that our daughter is 'special needs' and if our homestudy doesn't match our kidwe can't leave for a while. Seth came bursting into the hotel room searching through our homestudy trying to find where the child request statement would be. As he looked he told me that we would need to contact our social worked to write an addendum to the homestudy and need another 171 from INS (this is the elusive document that takes weeks for families to get). He assured me that it would go faster, probably requiring me to stay in Addis with the kids for another 5 days. Before I could dwell too long on what he just said, he found the two most fantastic words in our homestudy "special needs". We had asked our social worker to put in a statement about special needs, but weren't specific with any details. I'm so glad that was there! All is on target for leaving Friday night! and she was even willing to go off with the waiter who spoke Amharic to her in hushed tones while trying to calm her after her Daddy made a funny face that scared the jeepers out of her. Thankfully, she's willing to bear being with me. She's not so happy when I refuse to let any of the above people take her away. I'm getting a lot of shoulder shrugging and averted eyes, but I'm being persistent. She's my daughter and I need her to start understanding it. Her Daddy had to learn a hard lesson tonight. She refused to sit near him, look at him, or accept food from him after the whole "funny face that terrified me" incident. We made a relatively quick exit from dinner and she relented a bit before bed. He was allowed to sit next to her on the bed while we read books, but no touching, please. We have high hopes for tomorrow. Swimming and the playground in the morning then embassy in the afternoon. Disclaimer: This post was created by Seth due to Apryl's current need to feed baby JoJo and her mildly upset stomach. After departing from the Transition Home we made our way to a traditional Ethiopian restaurant. This experience put a new spin on our classic "dinner and a show" concept. Although it had been a really long eventful day everybody mustered the energy or at least put on a good game face for the evening festivities. Duni and Robel (AW's new in country travel coordinator; he's a wonderful guy I must add) teamed up to get the party started right, by ordering a combo platter of sorts that added up to a "taste extravaganza", a "flavor explosion", or if you're an American, mystery animal stomach with sauce. Mmmm, I may have been the only one to savor the flavor, and I must say, not bad, a little chewy but not bad. There was actually a tremendous variety of choices laid out before us on three giant platters of injera covered in a variety of combos of sauce and beef, lamb, etc. I think everyone was satisfied. Even Apryl found enough to stimulate her buds. sort of. Normally I think they take the beans and roast them while participants sit round about and observe the technique. This is followed by drinking three SMALL (like espresso size) cups of the freshly roasted and ground coffee and eating popcorn. There is usually a light aroma of incense in the general area (don't worry this is not some pagan ritual). I believe the three cups some how relates to the Trinity, it was lost in translation but the native Christian assured me it was ok. Our version consisted of a small brush fire (incense), one small cup of coffee and a handful of popcorn. Fortunately as a coffee abuser, I was happy for any quantity they could place before me. It was fantastic. On that note, the coffee here is out of this world. I must say this has been surpassed by the fellowship and company we have enjoyed with the others who have come with us to adopt on this trip. They are all sincerely wonderful people and I'm so glad we got to experience this with them. at 2 am. Apryl and I were up trying to figure out the finer points of removing video from our camera and turning it into bit sized pieces this system can handle so we can send and post a video. All that, and now it won't send. Oh, well; you're just going to have to wait. Today we met our kids! First, we had to endure the morning. The day is set up so that we spend the morning shopping, eat lunch as a group, THEN get to meet our children. It’s almost like torture! We spent the morning at a shopping area--open storefronts with aggressive salespeople trying to convince you to purchase an Ethiopian souvenir from them. After passing the store, some of the more aggressive sellers might even trail after you with a particularly delightful item offering a lower price with each step you take. Seth and I did a bit of damage there—we successfully purchased traditional Ethiopian outfits for each of our children and other gifts for our family. I hope to buy enough to give both Josiah and Salomae gifts on their gotcha day each year until they are 18. That would require more gift buying than I think I’m authorized by the money carrier (aka Seth). We did pretty well. Seth is a haggler, and I personally think he borders on lunacy with his haggling. Even if you didn’t try to barter, the prices are so low to us, we would be getting a ‘good deal’. After lunch at the Garden Paradise, we drove to the transition home. Every parent seemed to be a bundle of nervous energy. I was terrified that Fetya would freak out when she saw us. Or be disappointed. Or cry. Or run away. Or…insert ridiculous worrisome thought here. We videoed the trip down the road to the famous green doors at the transition home. I fully expected Fetya to meet the van at the gate. The Heinrich’s daughter, Selam, ran ONTO the bus when the gate opened. She threw her arms around Alice and hugged her. We looked outside, loads of big kids, but no Fetya. We walked into the home’s complex and still no Fetya. Finally, Rachel went inside the home and found her. She came out and I started bawling. She was saying, “Mommy, Daddy!” She was in my arms and reached out to touch Seth’s face. Me? Still bawling. She’s smaller than we imagined—but looks like she eats well (if you catch my drift). Fortuna, the nurse at the home, said that last night Fetya kept asking where her Mommy was. She pestered Fortuna and became so upset that Fortuna decided to “call Fetya’s Mommy”. She called the house phone from her cell phone. When the nanny answered, she pretended to be me and told Fetya that “I will be there tomorrow. I will come to see you tomorrow.” I guess that worked, until this morning when the pestering started anew. She was SO excited to see us. She mixed us up a little, calling me ‘daddy’ and Seth ‘Mommy’. 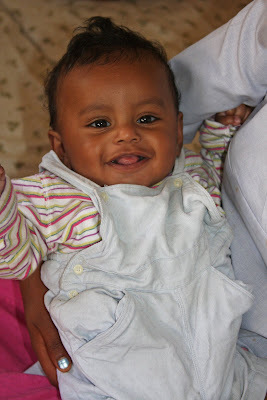 After Fetya came out, Yohannes’ nanny (each baby has a special nanny in charge of them) brought him out. I bawled…again. She didn’t pass him off immediately, I was holding Fetya, so Seth timidly put his hands out for him. He’s precious! The nannies had ‘fixed’ his hair so the curls on top all flipped the same direction from the middle of his head—a God given Mohawk! He seemed pretty uncertain at first, puckering his forehead and pursing his lips. By the end of the afternoon, he was laughing at us—though still prefers his nanny. They were visibly upset when we arrived, since they have taken such care with these children for so long. I held Yohannes and pretty soon he just fell asleep on my shoulder. We played and played with the older kids. I took pictures and videos—as much as I could manage with interruptions. If you are an AWAA family with a referral, please leave me a comment (if you haven’t already told me) giving us permission to take pictures of your kiddo. Tomorrow Jill and I are going to get busy with photos for everyone who is waiting…in an organized fashion. I have clips of this baby or that child (I even videoed some of the nannies’ children by mistake!) and aren’t sure who they match up with. I promise we will get it all straight tomorrow! When Fetya had enough of the bubbles, bouncy balls, balloons, and play dough (all a huge hit with all of the kids), she pulled me over to the big green gate and opened it. Then she gibbered off something in Amharic, obviously intending for me to take her to the van and GO. When Fortuna explained that she wasn’t leaving today, she went into panic mode. This girl has been SPOILED. She climbed into my arms and didn’t want to get down. I think she was hoping I’d forget that I was holding her and just leave! My knack for putting kids to sleep worked on her too, she went limp about 10 minutes afterwards. I laid her down and realized that my arms are going to be in pain after this week. 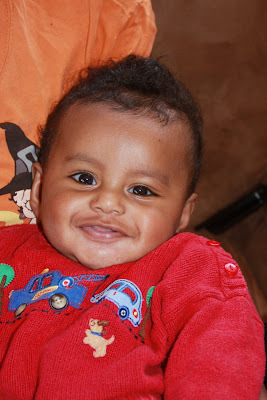 Yohannes has got to be the biggest baby at the home—he can’t fit into the clothes I sent last month! I’m going to try to download the video from this afternoon. Neither the Coen’s, nor us have capabilities to download photos onto our blogs. When I blew up the camera charger, I blew up our only chance to download photos. We are taking plenty of pictures, but just can’t post them until we get home. Frustrating, I know. BUT I hope that this video will work. Tomorrow we are going to bring the kids home. Fetya is an absolute hurricane of energy and this hotel room is going to get small very fast. Yohannes seems to be a very easy going baby. I’m nervous but so excited to finally have the kids with US. Thank you for your prayers—this experience has been amazing this far. I have a few minutes before heading downstairs...Seth and Marshall are battling it out at the ping pong table and I woul like to watch the game. It's a beautiful Easter day in Addis. The Ethiopians make a big celebration out of Easter, much like the hoopla that surrounds Christmas in the US. We had hopes of getting to a church service this morning, but decided not to go. We were wary of catching a taxi, unsure of how we could get back to the hotel after the church service. We didn't want to call one of the Christian drivers listed by the agency, since they would be celebrating with their families. On the way down to breakfast we met the Heinrich's (adopting 9 yr old, Selam) in the elevator. We must look obviously American, because Alice took one look at me and asked if I was Apryl. The Coen's were waiting in the lobby and we all enjoyed the buffet. The prices for food at the restaurants in the Hilton are comparable to prices in the US (even higher in some cases). Off the Hilton grounds, everything is much more reasonable. Yesterday, we paid $15 for lunch for four. For the buffet at the Hilton, it was $35 per couple--included in the price of our room or we probably wouldn't have splurged on that. Future travelers--this isn't included unless you are a Hilton Honors member, if you are, be sure to tell them at check in, or before. Our room was upgraded and buffet included for free because of this. Seth only mentioned it because he wanted the points, that turned out to be a very nice bonus. We have spent the day walking around the grounds of the Hilton 'compound' and getting to know the other couples here. Our evening plans are to leave the compound and brave real Addis for dinner. I would love to post a few pictures of us from today, but alas, blew up my camera charger this morning. I'm on a roll with electronics! We did get the hotel safe fixed and I am no longer allowed to operate it. I have another camera that won't download photos onto the laptop. We are taking the pictures, just can't post them right now. We will be sure to download some video from tomorrow! For clarity: We will meet the kiddos tomorrow afternoon (Monday). Tuesday we will go back to the orphanage and pick the kids up, from this day on they will be with us! Our last picture as a family of five! We miss you three! After a delay in DC, we spent 16 hours on the plane and arrived this morning. Logically we should be revved and ready to go. We just lounged for 16 hours! The airlines were very efficient in providing drinks, meals, and hot towels. Just about when we started to drift off it was time for another round of trash pick up or meal preparations. I finally called it quits on sleeping and read three books (thanks, Vicki!). The plane was PACKED; not an open seat to be found. Easter is tomorrow, so most of the people on the plane were coming home for the holiday. We were sitting by two rows of families with small children. I relished every minute of freedom we had; since we will be in their shoes on the way home. The cultural differences were immediately apparent as every child that passed Seth (who was on the aisle) rubbed his knee or touched his shirt. When they lingered, their parents just smiled and let them visit with him. If you know Seth personally, you KNOW that he's not too big on people touching him. Pretty big adjustment for him! He jumped out of his skin when one little girl stuck her hand down his shirt pocket. Upon arriving at the airport, we had few instructions to follow and managed to murk those up. Even after the instructions from Penelope, we still got into the wrong line for visas. It was all resolved, but we were a bit frustrated with ourselves for not being better prepared. Barrett and Rachel met us outside of the airport then we went to lunch. They are a fun couple who seem to enjoy what they are doing. They told us all about Fetya over lunch. She's evidently quite a jokester. She takes liberties, but makes everyone laugh at her. I'm excited to meet this little girl of ours! I'm also a little nervous, Rachel mentioned that Fetya may have a hard time initially. She is anticipating our arrival and understands that she will leave with us. But it's unclear how MUCH she understands. She's had many changes in the past year--first spending 6 months at Kids Care Orphanage, then moving to the America World Home in February. She took a little while to warm up there, but has blossomed and is loved by the others who live there. As much as she has heard about us, seen our pictures, and been pumped up for her departure--she's still going to be destroyed when she realizes that she won't see Rachel or Barrett again, the nannies, and likely she won't see many of the friends she has made. Much loss in the past year for this little girl--please pray for her! Seth and I are at the Hilton settling down now. We've had the afternoon to adjust a little. Both of us were so exhausted we took a nap (we arrived in ET at 3 am our time). The rest of the families arrive later tonight. Seth ate an Ethiopian lamb dish for dinner and will probably pay for that. He fools himself into thinking he has an iron stomach. I've possibly caused permanent damage to the in-room safe...with all of our valuables inside. So far, so good! I've been running like mad for at least 2 weeks. Today it will finally pay off. We are packed and (I hope) ready to go! Seth and I fly out tonight, but have to take the kids to their grandparents for the week (2 hours away). I've been teasing Everett relentlessly about a tooth he needs to pull before I leave. Yesterday, he checked that off the list! 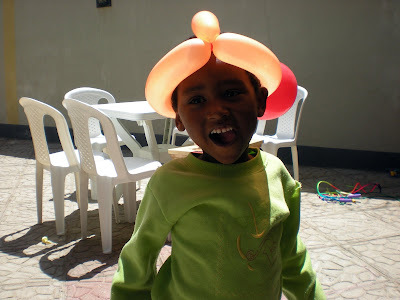 Our next post will be from Addis! We covet your prayers for our health, meeting our kids, the three who are staying with family, and for our trip back! Sometime during the long winter, I reconnected with a friend. It had been ages since we had spoken and she called me out of the blue. Or so it seemed. My friend and I have known each other since college. We became fast friends and helped each other get through some tough classes. We kept in touch and visited each other a few times since graduation. Not nearly as often as we would have liked. Like it so often happens, we lost contact with each other several years ago. I have to admit that though I try so hard to stay in touch with my friends; I let it get away from me. Before I blink it seems like months have passed since I've called a cherished girlfriend. All of you, who are dear to my heart, please know this--I pray for you! I pray fervently for you, in the situations that you bear daily. I pray that if you don't KNOW Jesus, you would come to see him as your Savior. If you love Him dearly, I pray that you would live your life in a glorifying manner. I pray for your children, your husbands, your jobs. I've prayed over each of you who have been expecting new additions to your families. I confess that I haven't always been so diligent in my prayer life. I wish I would have been! So, this dear college friend, who I haven't talked to in years...I've been praying for her, too, for years. This winter, maybe it was the weather, the wait, or a bad cup of coffee, but I had a moment as I was praying. It's sad to think about now, but I was praying about my friend and said, "Lord, I haven't talked to her in ages. I don't know what she's doing or what is going on in her life. I don't even know how to pray for her anymore. Should I stop?" It sounds horrible doesn't it? I didn't mean it in a bad way, but felt a little inept in my prayers. Praying that she would be drawn to the Lord, but not knowing the circumstances in her life. Well, wouldn't you know, God never wants us to stop praying for others! (Can you see the big flashing 'Duh!'). One evening, just a few days after praying that prayer, my phone rang. And it was this friend! She said she just started 'wondering what Apryl is up to,' so she googled me. My wonderful little blog popped up. She's such a good friend that she didn't tell me it bored her to tears, but she sat and read the ENTIRE story. Then called me, and we talked for three hours! God answers our prayers in amazing ways, doesn't He? That's not the end of the story though! This friend took it upon herself to let her family and friends know what we are up to. Then, she sent me a big, FAT check from all of them to us. God poured His blessing out on us through a group of people that I never would have expected to hear from. Now, would you call that a coincidence? My friend, who-knows-who-she-is, I hope you know how much our family has appreciated your kindness! I will continue (*smirk*whether you like it or not) to pray for you, and if I haven't heard from you in a while, I'll ask God about you and just wait for the phone to ring. That is so much more amazing than picking the phone up myself! May I use that as a legitimate excuse? How about the whole I'm-a-homeschooling-mom-to-five-kids routine? For this cause I bow my knees unto the Father of our Lord Jesus Christ...That Christ may dwell in your hearts by faith; that ye, being rooted and grounded in love...know the love of Christ which passeth knowledge, that ye might be filled with all the fulness of God. I have about 10 things I should be doing right now (that includes sleeping). But, this is more fun than mopping or sewing or folding some more clothes! On Saturday, ladies from our church hosted a shower for our family. It was an astounding blessing; and as hard as it may be to believe, I was speechless! 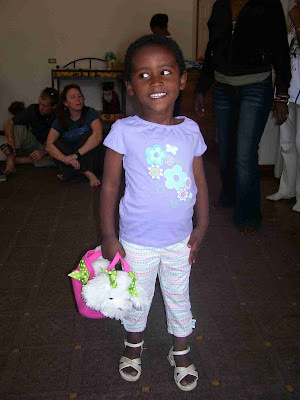 We received many gifts for our kiddos and donations for the orphanages in Ethiopia. I was so busy that I only managed to snap one photo. It is a doosey, Ella squinting at me from the deck while munching on a chicken nugget. It screams "Baby Shower!" I will have to rely on the responsible ladies who were taking photos to share them with me (get the hint?). Mentioning photos makes me cringe because it reminds me that I have a camera issue. Really a memory stick problem. Not necessarily something you want to deal with THREE days before you leave the country to meet your children for the first time. Especially when the new memory stick you bought came from a company who "is on holiday until April 28th". No store, company, or manufacturer really buys my pleading that "I'm leaving for AFRICA in THREE days!" They are probably thinking I deserve to run out of memory space since I've waited so long to handle this. They would be wrong for thinking that, I started dealing with this weeks ago. None of my solutions have worked. All have ended in a "C:13:01 format error". Nice. My mother in law is going to give us a second digital camera as backup. We had our travel conference call this afternoon. It, like all travel preparations, was surreal. I felt like I needed to pinch myself. After waiting for what seemed like so long, we are finally really going to Ethiopia to bring home our kids! It's every other Friday today! In my haste to do things, I forgot that today is "our update Friday"! I took a break from the chaos and ***ahhhh*** an email from Rachel! She wrote: "Apryl, see you soon!" 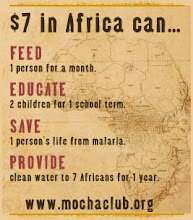 I'm still having a hard time believing that we are really going to Ethiopia next week. The best part of the update, by far, are the pictures. 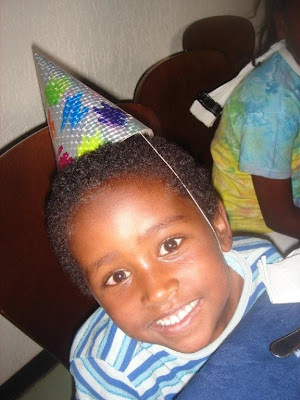 Yohannes' picture may rival my number one pick--it's a perfect photo to accompany Rachel's update. Yohannes is becoming so expressive. To watch his facial expressions is so entertaining and keeps that nannies laughing! 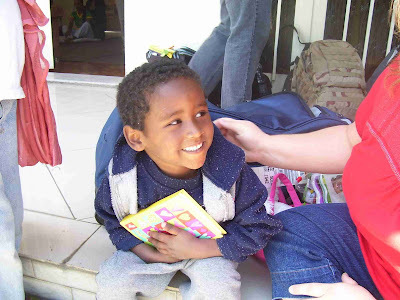 Yohannes gets lots and lots of attention and loving on! He is very alert, responsive, and interactive. He continues to be healthy and happy! Everyone is starting to talk about Fetya’s leaving soon. She is such an entertaining and fun child, and will be missed around here! The older children just laugh at her, as well as all the staff. At the recent birthday party of another child at the transition home, we discovered that Fetya does not like pizza or ice cream! Fetya is usually a GREAT eater, but she wasn’t so sure what to think about the strange food placed in front of her. Maybe she’ll never be an adventurous eater, or maybe she’ll change with all the food choices in America! Fetya continues to be very healthy and happy! Maybe I'll have to steam up some spinach on pizza night! We leave in just 6 days--it's unreal! I just got a few photos from a family who picked their daughters up last month. They were so excited to hear that we live within a few hours of each other. Their little girls and Salomae had become friends at the transition home. Doesn't she look like a jubilant kid? Penelope was so kind to send me a travel email complete with photos. I actually printed her travel list from her blog because I knew it would be the most comprehensive I could find. It is FIVE pages long. Now you understand a little bit of what I'm dealing with. Seth seems to think we are just "throwing some clothes in a bag." That is a direct quote. He lives in blissful ignorance. I have enlightened him. Among packing, I have doctor's appointments, speech therapy, and Ella needs a new leg. Perfect timing on that one. Her prosthetist just took a new job in Tennessee. Perfect. And school...sigh. School. We *will* be done with school next week. Regardless. I take that back. I will be done with school next week. The children may continue on for the following week, it's completely up to the replacements (aka in laws and my parents). They may have a strong desire to teach that week. You know, tie up some loose ends. Totally up to them. No pressure or anything. But, hey, isn't that a cute picture? I'm thrilled that they sent that along to me. In less than one week we are leaving! Only 9 days until we meet our kids! I have a friend who annoys me to no end keeps me accountable. She continues to pester me gently remind me that I haven't taken the time to post the rest of my kids' pictures. So, to appease my friend and make my life easier...I made a slideshow. Before said friend decides to remark on my musical choice--I had no song that burst forth in my mind when I made this slideshow. I happen to be partial to Vivaldi's Spring. That seemed quite appropriate to me, since we are coming into spring after such a long winter. Enjoy! This is the best I could sling together as I run amuck. Every once in a while I screech at an unsuspecting child, "We are leaving in 8 days! Can you even bear it? EIGHT DAYS!" Poor kids, they will be so happy when they get their real mommy back. We are officially a family of SEVEN! I'm thrilled to be able to introduce our two newest additions. Without further adieu (and since you probably just skipped all of this to see pictures...) this is our daughter, Fetya (pronounced Fit-e-yah). Picture of Mel giving her the "goodies" we sent, she's holding an album with photos of our home and family. Here she is strutting her stuff in the clothes that Eli picked out to mail her. 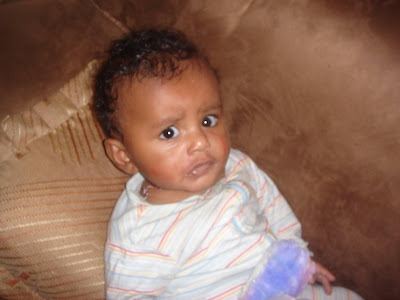 This is our son, Yohannes. Here is our referral picture. This is my favorite picture of him. He's just absolutely adorable! This is a recent picture that Lenka took. He's smiling in almost every photo that I have. This is from last week's update from Rachel--he's changed so much in the past two months. I can't wait to get my hands on his squeezy cheeks! So there you have it--our two newest additions! More photos to follow! Today was one of my longest days. Ever. Court is tomorrow and I'm nervous. I shouldn't be. I can't help myself. My dear traveling buddy, Jill, had just what I need. Phillipians 4:6-7 Be careful for nothing; but in every thing by prayer and supplication with thanksgiving let your requests be made known unto God. And the peace of God, which passeth all understanding, shall keep your hearts and minds through Christ Jesus. Since I'm not nearly as 'spurtual' as Jill is (she's married to a chaplain! ), I didn't spend my day meditating on God's Word. I just tried to...well, spend my day. Checked my email at least 15 times...the time spent varied and the content varied so I can't honestly give this an overall score. Taught my kiddos-Among other imperative-that-you-master-this-immediately-in-order-to-succeed-as-an-adult-lessons, I taught Everett how to make a cursive 'L'...only took about 2 minutes of my time, but was pretty successful in keeping my attention. We also read a bit of a Gladys Aylward biography...far more impact from this than cursive! Gave Ella and Eli a math lesson...took about 30 minutes and every bit of patience and attention I could muster. Talked on the phone with various friends...not such a success because we talked about court, adoption, and upcoming baby shower. That shower alone makes me nervous! Read blogs...took up loads of time, but alas, I continued to dwell on MY kids. Went grocery shopping...I hate grocery shopping almost as much as I hate running with a double jogging stroller. This was very effective on all counts. It took FOREVER and sucked every ounce of brain power I had to give. Watched "The Black Stallion" with my kids...when all else fails, it seems that the TV is the perfect time waster. Right? Wrote this post...probably about 5 minutes (you really deserve more of my time than that). Now, I've got butterflies because of it, obviously not such a good choice. My evening plans include going through all of Ella's clothes that are size 4. That probably won't relax me a bit. I should really follow Jill's lead and spent some time CALMING DOWN. One more day until we are officially a family of SEVEN! Please join us in praying that all the paperwork is in order for our appointment in court tomorrow. Ethiopia is about 8 hours ahead of us, so don't wait until tomorrow afternoon to pray! I will post pictures of our kids right after we get the call or email from Duni. We can hardly wait! This is just a test to see if I can update the blog via email. Since I'm partially computer illiterate (that may be a surprise), I thought I should give it a try before we actually leave. By the way...only TWO days until court! When we got our court date, Duni said that AW planned for us to travel 2-3 weeks after a successful ruling. This went in one ear and out the other. I guess I had to process that for about a month before I realized that 2 weeks really may mean 2 weeks. I emailed her this week about our possible travel date and she said they still want us to travel on April 26th. I freaked out. Common theme around here. The freaking out. Total freaking out when I realize that April 26th is only 3 weeks away. THREE WEEKS FROM NOW WE COULD BE IN ETHIOPIA. Shall we all do a little freaking out? Not you, dear reader, as you calmly sip your beverage of choice and read my delightful insights on our life and adoption. I'll run amuck enough for both of us. By the way...FOUR days until court! Your son won the contest for the biggest baby, and his nannies were very proud! He is obviously healthy, happy, and thriving! His eating, sleeping, and bowel movements are all normal. He continues to be a favorite and win people over with his smile. The older children play “peek-a-boo” with him, which really gets him laughing hard! For breakfast the children eat traditional Ethiopian bread and drink hot tea. Lunch can be a variety of things. Our side items are usually steamed spinach, cooked vegetables (beets, carrots, potatoes), or salad (lettuce, tomato, onion, peppers). The main dish is pasta with tomato sauce or meat sauce, rice with veggies and sauce, or injera with a lentil sauce. The children usually have a snack around 5:30 pm, which they eat bread with honey or fruit. Dinner is eaten around 8:30pm, and they eat the same thing as lunch. Hmm, steamed spinach? We may have a problem. I can't recall a time I've ever eaten steamed spinach. Like without a saucy coating? Like just PLAIN steamed spinach? Do you think Salome will notice that the rest of us are eating pb&j while she enjoys spinach for lunch? I think it's pretty cool that she eats so healthy. Sadly, I'll probably ruin her for steamed spinach by introducing her to the beauty of peanut butter. I've met your little girl & spent some time with her. She's definitely got personality! She was very sweet with me and definitely wanted to get my attention. I really think she's going to love being in a family and I will pray that she & Ella will have a sisterhood for the ages. Sisters are the best. The Steigers sent us photos last week. Tons of photos. Tons of very great photos. Next week I will gladly, exuberantly share these photos with YOU! Only 6 more days until court...this is still unreal. For about a week I've been basking in the miracle of adoption. If you snicker at the cheesy ring that sentence has, well, humor me. It's late and I've eaten the last bit of chocolate in the house. I'm not fibbing about the basking (or the chocolate). On a sidenote-I hate that the word 'miracle' has been so overused that it doesn't stop someone in their tracks when they hear it. It's this desensitized-yeah-whatever attitude that keeps people from stopping to contemplate a wonderful happening. So, I'm using the word miracle in it's most proper sense. An inexplicable act of God. Are you with me now? Sit still for a spell...and...think...about the miracles that have to take place for one child to meet up with their forever family. Don't make the mistake of thinking that it's just filling out paperwork and then being paired with a child. That would be like saying birthing a baby is buying a pregnancy test and finding an OB. Some of these miracles we never hear about, but, oh, I can only imagine. I have been, imagining (as I'm furiously still trying to unscrew one stubborn bolt from Ella's headboard...two days later). I'm wondering what happened before our referral. How many 'little' miracles had to take place for our kids to meet up with us. I'm absolutely certain that there is an amazing story of God's providence behind our long wait. 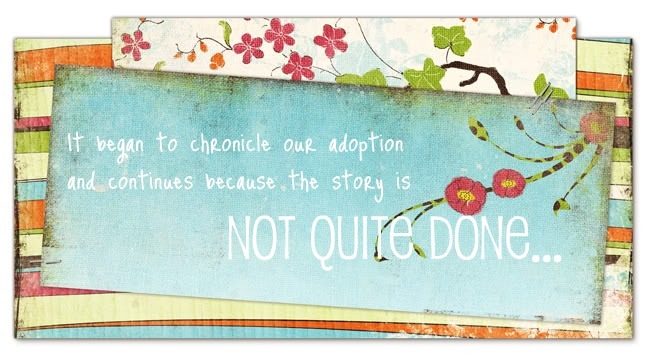 I witnessed the miracles that took place when we adopted Ella. At the time they were inconveniences. Some of them were downright dreadful. Then the day came when God drew back the curtain and we got a glimpse of what was going on backstage. What a story. It gives me chills when I think about it. And I'm in awe again, wondering what has gone on to bring these two children into our family. This post seemed so timely to me.